Audi is one of the world’s leading premium brands and has been part of Volkswagen Group since 1965. The company operates in more than 100 markets. In the past fiscal year, Audi faced challenges from a difficult market environment and the new WLTP test procedure. The brand delivered a total of 1.8 million vehicles, a decline of 3.4%. Vorsprung” is an active brand promise that is delivered throughout the world, making Audi one of the most highly desired brands in the premium segment. In 2018, the brand had around 20 market launches, thus continuing the renewal of its model range and further strengthening its product portfolio. Audi presented the new A6, the eighth generation of its successful premium saloon. The A6 features dynamic surfaces, sharp contours and striking lines, conveying sporty elegance, cutting-edge technology and sophistication. Audi also presented the new face of its Q family for the first time: the Audi Q8. This combines the elegance of a four-door luxury coupé with the practical versatility of a large SUV. Its distinguished design is underlined by an imposing octagon-shaped, single-frame radiator grille, an elegant sloping roof line and up to 22-inch wheels. Audi started its electrification offensive in September 2018 with the world premiere of the e-tron. The SUV is the first allelectric production model from the brand with the four rings. Its comfort and spaciousness are equivalent to a traditional premium model. At fast-charging stations, the e-tron is ready for a long-distance drive after 30 minutes. A large number of pre-orders for the e-tron had already been received by the end of the year. By 2025, Audi plans to offer at least 20 electric models. Test drives with the Audi e-tron prototype in the African desert. Model presentations from the Audi A1 to the R8. Information from Formula E and DTM. 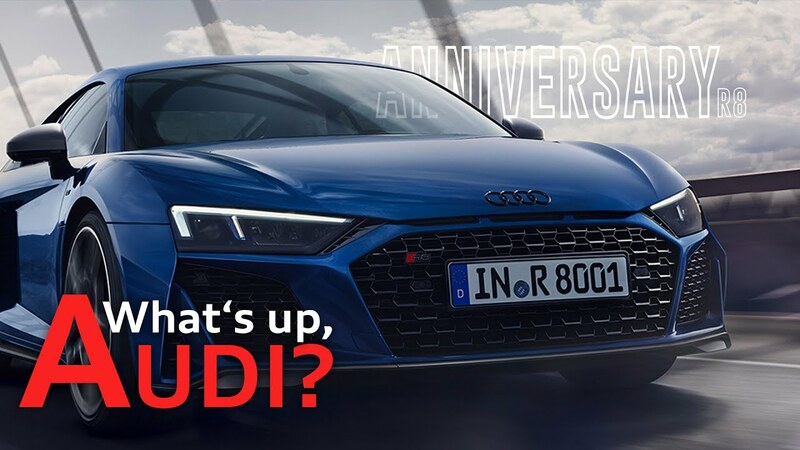 Looks behind the scenes in Development, Design and Production: The YouTube formate “What’s up, Audi?” shows what's going on at the four rings. Every two weeks, YouTube star Misha Charoudin and Connie Böhm from Audi Communications are presenting new models, current company topics and interesting guests in the show. Watch now! Experience our theme worlds and be fascinated.